Using bio-compatible material manufacturers of medical and dental products can rapidly prototype a number of devices, including dental delivery trays and surgical orthopaedic guides, because these materials offer optimal visualisation as well as maximum dimensional stability. The rigid medical rapid prototyping material, MED610, is a bio-compatible PolyJet photopolymer featuring colourless transparency and high dimensional stability. Ideal for applications where prolonged skin contact is required for more than 30 days, or short-term mucosal-membrane contact of up to 24 hours. This material has five medical approvals including cytotoxicity, genotoxicity, delayed type hypersensitivity, irritation and USP plastic class VI*. 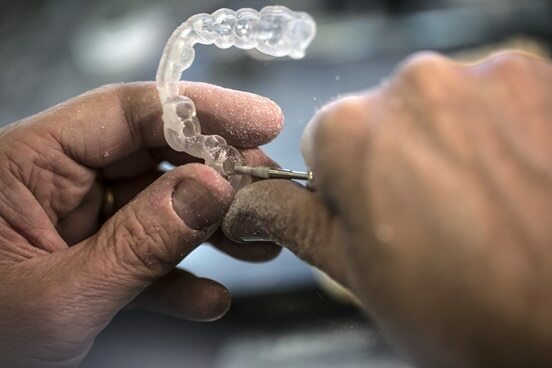 This amongst many other reasons, is why Dr. Richard Nejat DDS, a diplomat at the American Board of Periodontology and a periodontist in New York, has implemented 3D printing using MED610 material into his dental implant guide production routine. Dr. Nejats office uses the Objet OrthoDesk to 3D print the surgical guides for his practice. Guides are printed in the bio-compatible material that is deposited in 28-micron layers and built up to full geometry with support material. The support material is later removed, leaving an accurate, clear surgery guide with a hole to guide the drill. These guides can be printed on an as-needed basis or be bundled and printed in batches of seven surgical guides in a seven-hour print cycle. The print time depends on the height of the surgical guide; the higher the guide, the more passes the print head needs to make and the longer the print job will take.